Searching for the missing piece to complete your ergonomic workstation? The E3 Donut Stool is fun supplemental office seating that gets you out of your office chair and into more active perching positions. Sitting is a necessity when you have a desk job, but sitting still too long can affect your health. Give yourself seating options by incorporating a sit stand stool into your daily routine. The E3 Donut will give you the freedom to lean, shift, and stretch out when you're feeling a little more energetic. And the cushion's unique "donut" shape and center divot provide relief for your lower back and legs that can be positioned as you need it. Energize your day, improve your circulation, and enjoy a more active lifestyle in the office. 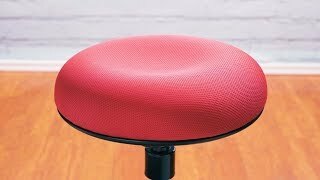 The Donut's dynamic seat will prompt you into more active sitting before you know it. One amazing feature of this stool is its pivot point, located underneath the seat. The stool angles and tilts from this point, allowing you freedom of motion while keeping the base flat on the ground. It adjusts as you do, engaging your back, legs, and core as you move. Varying your posture throughout the day will do wonders for your body, and the E3 Donut Stool works best when used in conjunction with a traditional, lumbar-supporting chair, so you can switch regularly as you feel the need. The E3 Donut Stool's seat is upholstered in mesh fabric that's both breathable and supportive. The mesh texture creates friction to keep you from any unwanted sliding while you're tilting and moving on the seat. Now take a seat; the cushion itself boasts a curved edge and the pronounced center dip that gives the Donut its name. These features help to keep pressure off your glutes and tailbone, allowing you to maintain optimal circulation. Lastly, collaborate comfortably with your visiting colleagues; the swivel seat rotates a full 360 degrees so you don't have to twist awkwardly to talk to your coworkers. Don't confine active seating to the office. At just over 10 lbs, the E3 is lightweight for easy portability. Bring it into the kitchen or living room as spare seating. With an extensive height range of 24.2" - 30.1", even shorter users will find it a great fit at the table or bar. You can take advantage of the Donut's active support wherever you go! Why do I need a sit stand stool? Because an ergonomic chair is only half of a solution. A soft cushion and lumbar support are incredibly important, but ergonomists also recommend that you change your posture regularly throughout the day. That means standing up. If you find yourself getting tired while standing, that's where a good stool comes in. Lean or perch on an active stool while you're on your feet, to help you engage your legs while taking a little pressure off them by perching on a supportive seat. Does this stool work with a height adjustable desk? What is its height range? Yes, the E3 Donut Stool by UPLIFT Desk is the perfect companion to use with your adjustable height desk. This stool adjusts from 24.2" to 30.1", making it suitable for a wide range of users and sit-stand desks. Is this stool too short for me? As long as you are under 6'3" tall, this stool should be a good fit for you. It is designed to be comfortable for most people. Can I use this instead of a regular chair? We generally recommend using sit stand stools in conjunction with a normal office chair. Traditional chairs offer back and lumbar support that stools generally do not. Use the E3 Donut Stool to work a little activity into your day, and settle back into more standard seating when you get tired. Is the Donut Stool good for children? These stills are designed for users from 5'1" to 6'3", so depending on their height, this stool might work well for middle school and high school aged children. Most kids are likely to find the Donut a little bit tall, however. If you're looking for a sit stand solution for one of your little ones, check out our children's stools.